'Timurid' refers to Timur Tamerlane ('Timur the lame') the founder of a Central Asian empire with Samarkand as its capital. Though not an ideal name for these gardens, Timurid has gained acceptance. Other, more geographical, names are problematic. Sogdian was the Achaemenian name for the area; Transoxania is used for the pre-Islamic history of the area; Uzbekistan is the current name for the territory. 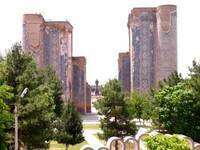 The Timurid buildings and gardens of Samarkand were the work of Persian craftsmen employed by Turcic rulers of Mongol origin. When occupied by the young Babur, later to become India’s first Mughal emperor, Samarkand had examples of both religious and domestic enclosed outdoor space. Timurid gardens and architecture was Persian in character, with an ancestry reaching back to Passargadae. The Timurid princes lived in fortresses when necessary, in yurts when on campaign and in encampment gardens when possible The only significant survival of a Timurid garden is the Ak Sarai (White Palace) in Shakhrisabz. Its characteristic blue-tile architecture also survives on many religious buildings. 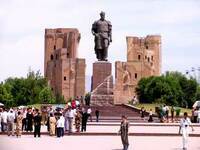 See note on The Golden Journey to Samarkand.